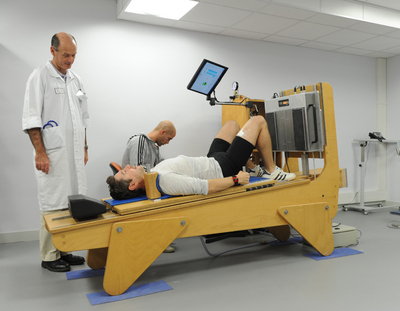 Exercise time in a bedrest study (Credits: ESA). Stay in a tilted bed for weeks with your head at the lower end and your body starts to change as if it were ageing prematurely or living in space. Twelve volunteers in ESA’s bedrest study are enduring the testing experience. The ‘pillownauts’ have to stay in a bed for 21 days that is inclined at 6º. The rule is that at least one shoulder and their hips must be in contact with the bed at all times, even when they eat, wash and go to the toilet. As their muscles diminish – one participant has lost almost four kg – medical staff at the study clinic MEDES in Toulouse, France monitor them closely. “We want to find the best possible solution to counteract the effects of staying in space or being inactive when muscles and bones are not used regularly,” explains ESA specialist Vittorio Cotronei. Two groups of volunteers follow a short but intense exercise routine on a vibrating plate that exercises leg muscles as they absorb the up-and-down motion. Straps pull them onto the plates with a force equivalent to 100–200 kg while the pillownauts perform upside-down leg-presses for a few minutes. The exercise routine is repeated every three days. “It is not a lot of time but you definitely feel it,” says Eddy, from the exercise group. One group is doing the exercise and taking protein supplements just as bodybuilders eat to increase their muscles. The third, control, group is being monitored to compare results. The volunteers are looking forward to the end of the year, when they can leave their sloping beds after 21 days for four months of rehabilitation. They will return for another two 21-day stints, each time taking part in another of the three groups. In the video below, a fragment of a vintage bed rest study.